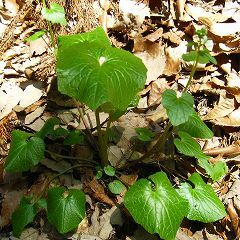 The horse-radish is a perennial hydrophytes of the cole department horseradish belonging. The country of origin of this horseradish is Japan. There is stimulated the peculiarity and strong a smell taste, and it is used well as a sushi and a tea pickle. This photograph is a horse-radish that I am experimentally growing. It planted it to be near the flow of the land surface water of Sugibayashi's valley. It has been year second since planting. It revived though a big leopard fell last summer and the leaf had been done. Because it is not a place with the stream, it is way near the horseradish that grows naturally to plant. The soil is sands though the fallen leaf has accumulated. It is scheduled that stock division does and is increased next year. Still, it seems to have to plant it in the place where the stream exists in enlarging the rhizome. I will try next year. The flower bloomed for the first time in two places of the horse-radish that I was growing. 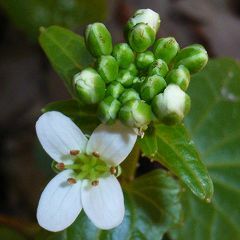 The number of small, white petals is 4, and there seem to be six androecia. It is the very lovely one. How what is it though not thought by the Asian racoon and the wild boar that it eats the horseradish though here is a place of which the Asian racoon and the wild boar often go out?At present, it seems to be safe. It changes into the allyl isothiocyanate the sinigrin's included in the horseradish touching oxygen by grating the horseradish, and reacting with the enzyme in the cell and it becomes a pungent principle. There is a bactericidal effect with a peculiar sharp taste, too. There seem to be a protective efficacy of osteoporosis, prevention of aging, and an effect of the disease prevention in the horseradish in the recent research, too. When the rhizome of the horseradish is made the seasoning of Japanese food in Japan from of old and it eats the sushi, slices of raw fish, the tea pickle, and the buckwheat, etc. , it is used. Eating such as sushis and slices of raw fish with the life one is good because there is a bactericidal effect. When it eats the horseradish as it is, it is not so painful. If it doesn't touch oxygen, the horseradish cannot do the sharp taste. The cell can crush, and because the metal is not used, is said to the grater made from shark's skin in detail as a grater that it is the best. To dare to suppress the sharp taste, might a little it put, and you mix it with the soy sauce though you should grate and use the sharp taste of the horseradish at once because there are a lot of volatility one. The leaf, the stalk, and the flower of the horseradish can be made a boiled green. Moreover, the leaf and the stalk can be made a soy sauce pickle. Because this can be preserved, it is used for the putting suiting etc. of refreshments and the dish. Additionally, it is possible to make it to the tempura. About 100g, one teaspoon salt about 50ml of the soy sauce, and the material ..instant bouillon.. a little. one big spoon one big spoon-mirin spoon of sugar the leaf and the stalk of the horseradishPlease change the taste by the favor. After the leaf and the stalk of the horseradish are lightly parboiled, it cools it by water at once. The water is cut in the length of 4-5cm completely. The salt is put and mixed with this. After the seasoning of the remainder is boiled mixing everything, it cools it. It is a completion if this seasoning is added to the leaf and the stalk of the salt and the mixed horseradish and it soaks it around half a day. The cultivation of the horseradish is a water horseradish and a field horseradish. Generally, the known water horseradish is grown in flowing abundant water. The field horseradish is made for food by processing the leaf and the stalk to the whole small by the one literally grown in the field. Neither the water horseradish nor the field horseradish originally have the distinction. How to grow up is different because of the environment that grows up. The rhizome of the field horseradish and the horseradish that grows naturally doesn't grow so much though the rhizome of the water horseradish grows. This is an influence of the allyl isothiocyanate that puts out from the root by the horseradish and sterilizes a peripheral soil. Generally, the plant makes various bacteria live in the root and growth is obstructed if there is no bacterium in surroundings of the root because it grows up. It is not possible to grow by the soil's being sterilized with this material to which I put out the horseradish. The water horseradish grows up greatly because it has reduced the influence of the allyl isothiocyanate with the soil such as water and the sand that always flow. Abundant, beautiful water (10-18℃) and sands and sunshades are conditions of the growth of the water horseradish. The kneading horseradish with the powder horseradish and the tube is marketed as a domestic use. The West horseradish is used for this raw material, and in general, it makes to green by colorant, and such the one doesn't use this horseradish at all. It is displayed when the amount of this horseradish is 50% or more, "This horseradish use", and is displayed for less than 50%, "With this horseradish"Such a display not understood easily is like cheating the consumer. It seems to use the beard root of the horseradish for the kneading horseradish.